I was working with a child recently on her multiplication facts and asked her 6 X 6. “Just a minute,” she said and she broke into rap. “I only know them when I sing them,” she explained. You see, last year her class learned their facts by listening to times table songs. 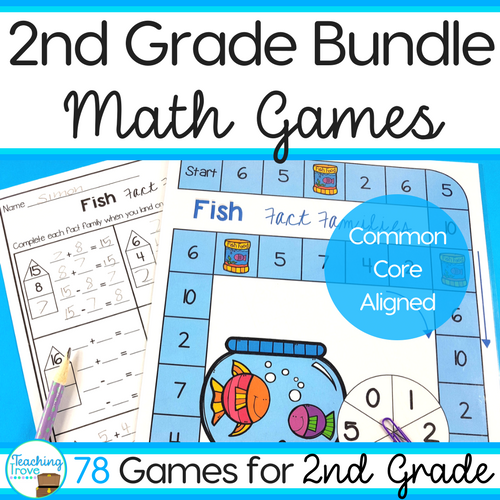 Mixing music and math is fun and can help children memorize the multiplication basic facts. But it doesn’t lead to fluency. 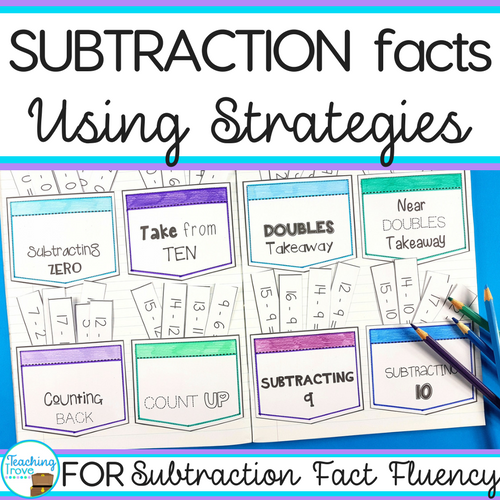 We teach thinking strategies for addition and subtraction to improve fluency so why not teach them for multiplication. 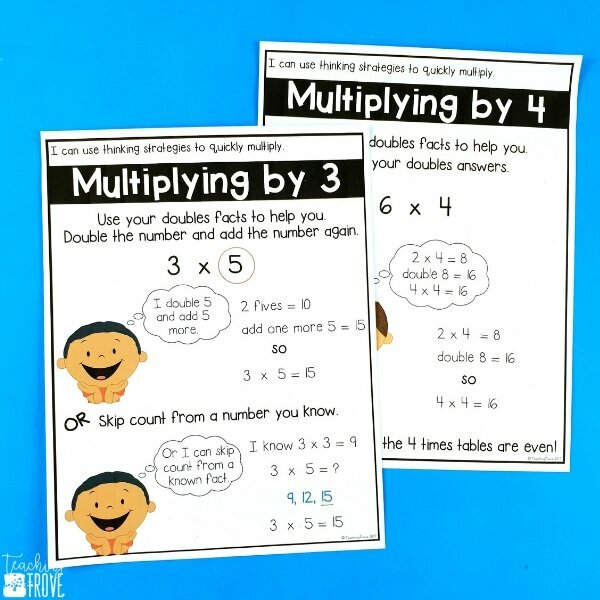 Multiplication thinking strategies will make learning the facts easier. So what are thinking strategies? 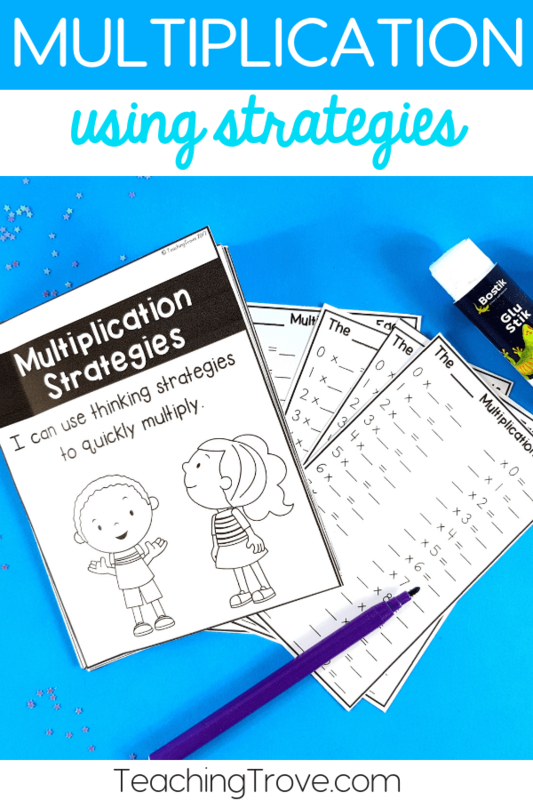 Thinking strategies are the tips and tricks we use to help students remember the multiplication tables. 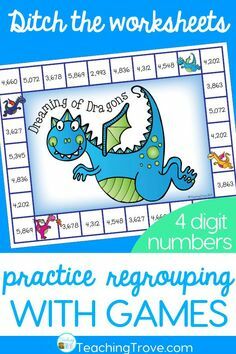 These are different from the multiplication strategies of repeated addition, skip counting, equal groups and arrays. (You can read more about them HERE.) However, thinking strategies will incorporate those strategies. 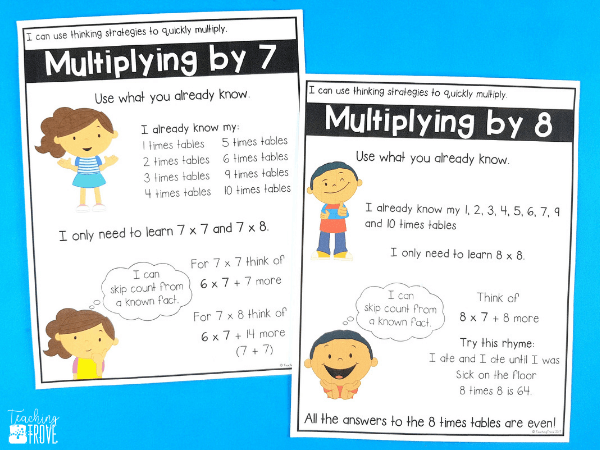 The first thing to remember when teaching thinking strategies is that multiplication shouldn’t be taught in numerical order. 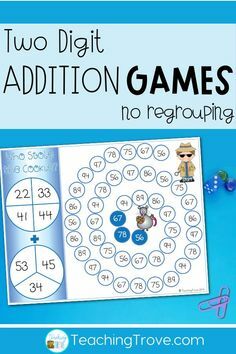 Taught this way, kids need to remember 144 different multiplication facts. 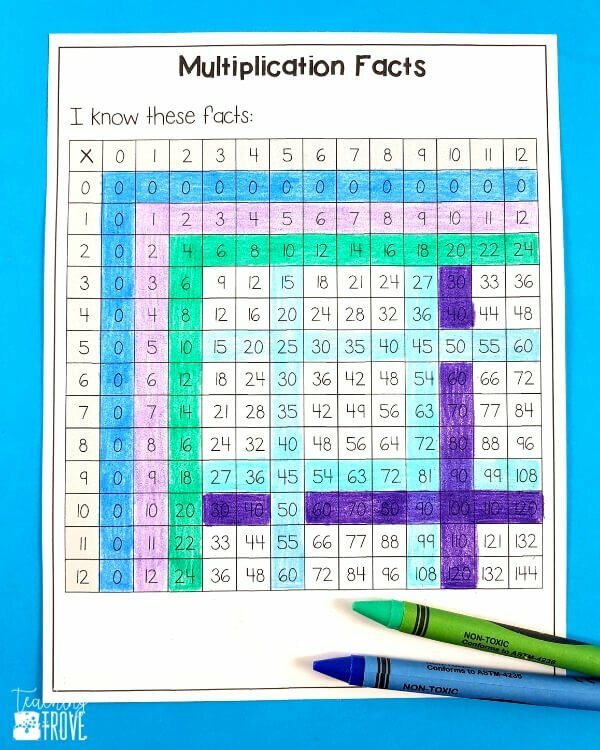 I’ve always used this order to teach the facts – 0 & 1s (I do these together), 2s, 5s, 10s, 9s, 3s, 4s, 6s, 7s, 8s, 11s, and 12s. 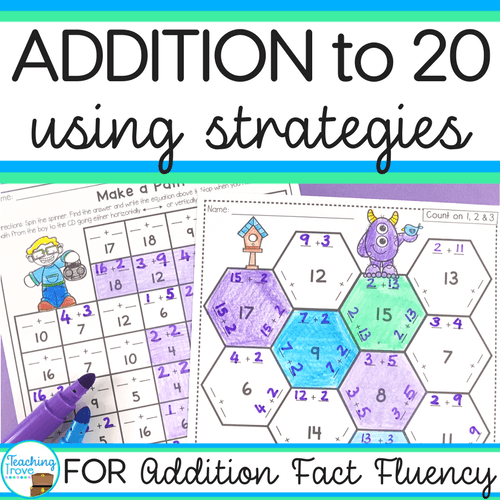 Before we even begin to teach the facts, children need to understand the commutative property. They should know this from addition. The commutative property states that the order of the factors doesn’t change the product, so 5 x 7 = 7 x 5. Knowing this will halve the number of facts to learn. Understanding that 9 ones are nine is self-explanatory. Making nine groups with 1 block in each group or using repeated addition helps illustrate that fact. 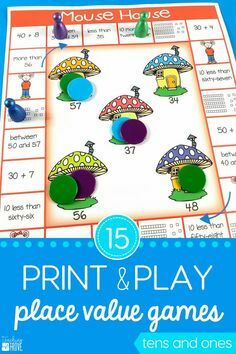 Children have also encountered ones when dealing with place value. 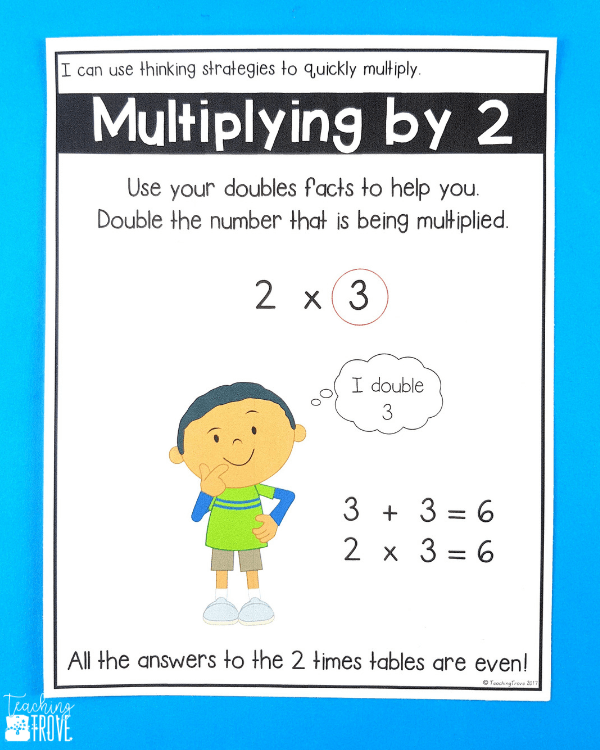 The multiplication facts for 2 are just the doubles facts. One group of 5 plus another group of 5 is 10, two groups of 5 are ten. The x symbol can be read as groups of. In fact, when you read x as times it makes multiplication very abstract so it’s best practice to use the wording ‘groups of’ or ‘lots of’. It will give students a very clear image of what 2 groups of 5 looks like. It’s also important to keep reinforcing the commutative property. If we know 2 x 5 = 10 then we know 5 x 2 = 10. 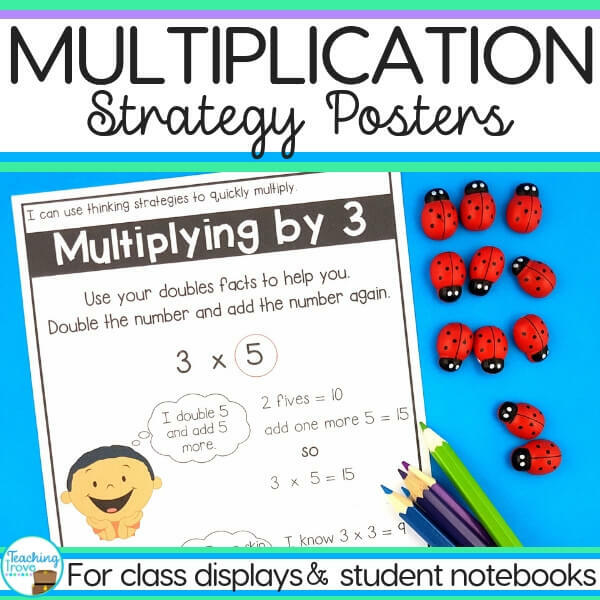 There are two strategies for multiplying by 5. Skip counting in fives is a good foundation for learning the five facts but I prefer the second strategy of relating the fives facts to an analog clock. It still requires students to count in fives but eliminates fingers and reinforces telling time in 5 minute intervals. By third grade, your students should have a sound understanding of place value. If you’re using the language of ‘groups of ‘ 3 groups of 10 (3×10) will be easy. 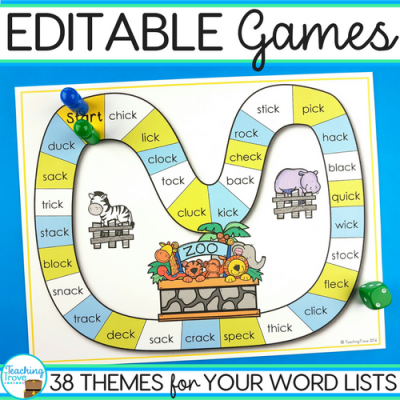 Your students will zoom through their ten times tables. Why do we teach it after the tens? The multiplication facts for nine aren’t hard. They have a very logical pattern, so when kids understand it, their confidence with their multiplication facts soars. Look at the multiplication grid below. The facts you’ve already introduced are colored in. Can you see that you’ve now taught over half the facts! Use a double to help with the 3 times tables. Double the factor and add it one more time. 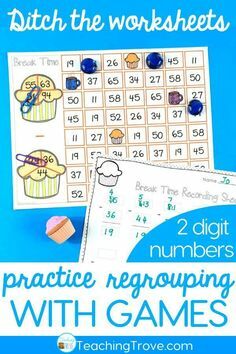 But if your students struggle with this, skip counting from a number they know is also a great strategy. Those doubles facts come in handy again when learning the 4s fact. Just double the double. 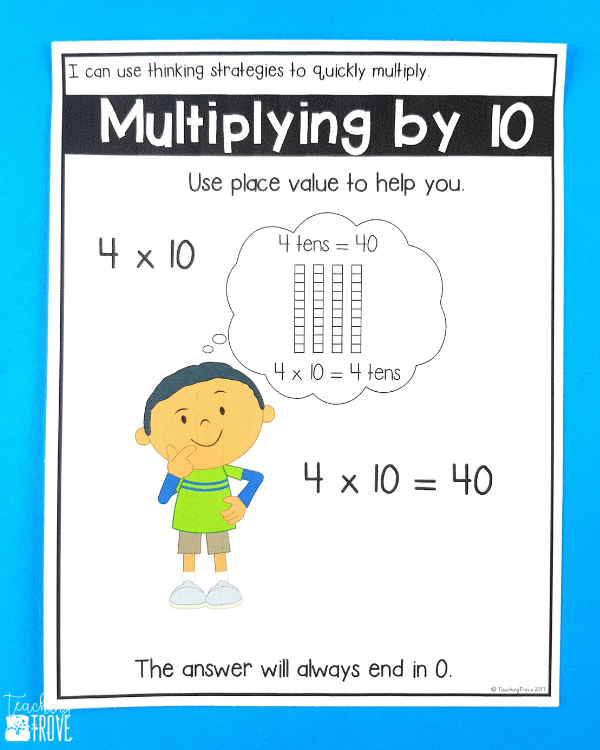 Charts are great for reminding students of the multiplication thinking strategies. Your class knows their fives facts so now it’s a matter of skip counting from a known fact to answer their six times tables. Plus with the 0, 1, 2, 3, 4, 5, 9 and 10s facts already learned, there are only five new facts to remember. And let’s face it, your class will have already worked out the pattern for multiplying by 11. That makes four new facts. Skip counting from known facts is the best multiplication thinking strategy here. It’s important that students start with the known fact and don’t skip count from seven. 8 x 8 (use the little rhyme to help your class remember), 8 x 11 (which your class probably already knows) and 8 x 12. 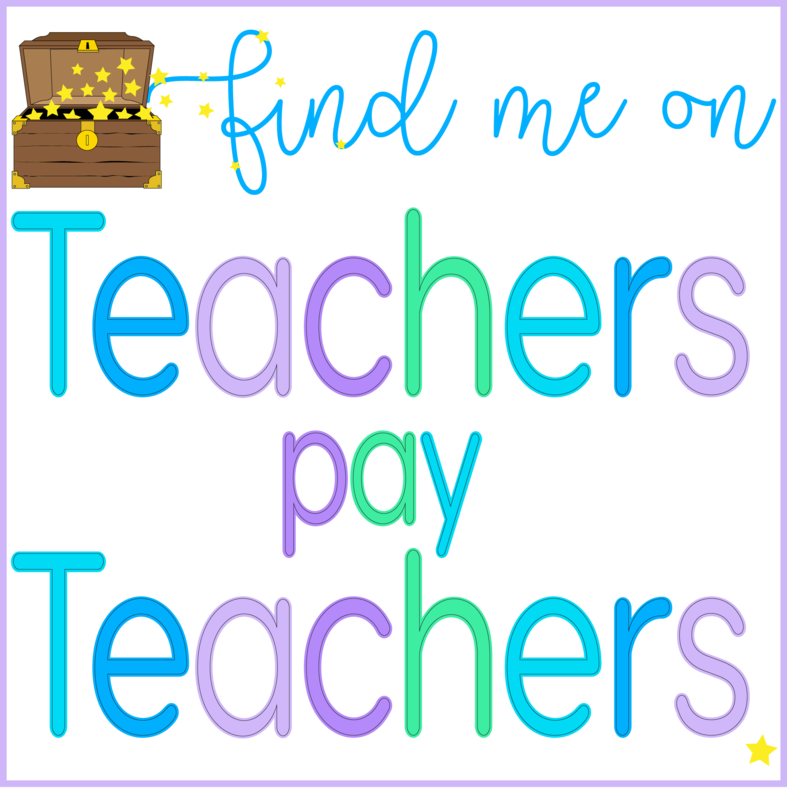 The Common Core standard CCSS.MATH.CONTENT.3.OA.C.7 only requires students to be able to multiply within 100 but many teachers will include the 11 and 12 times tables when they teach multiplication. If you’re teaching the multiplication facts for 11, I would be surprised if your class hadn’t realized that the answer is to double the digit. 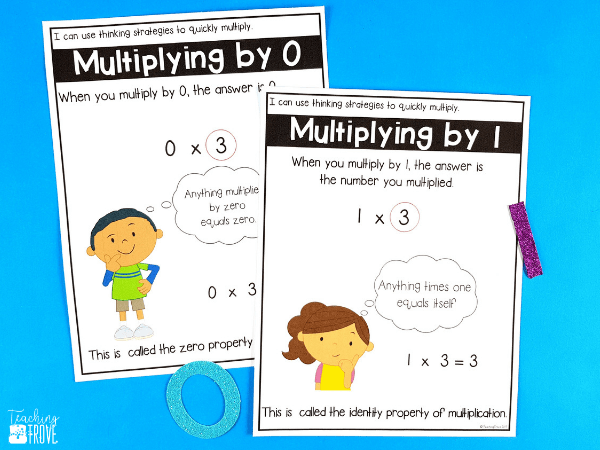 Multiplying 11 by itself or 12 is easy too. There’s only one new fact to learn. But the twelve facts do seem to be tricky, so teaching your students to make it two separate equations helps. 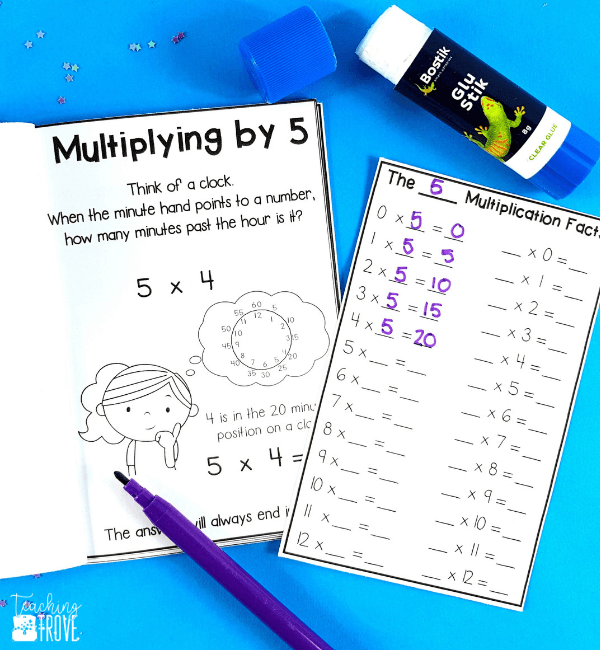 The twelves facts should be broken up into multiplying by 10 and multiplying by 2 then adding the products. Skip counting will also work. Remember when using skip counting students should start with the nearest known fact. So if they know 11 x 12 = 132 they are adding 12 to 132. 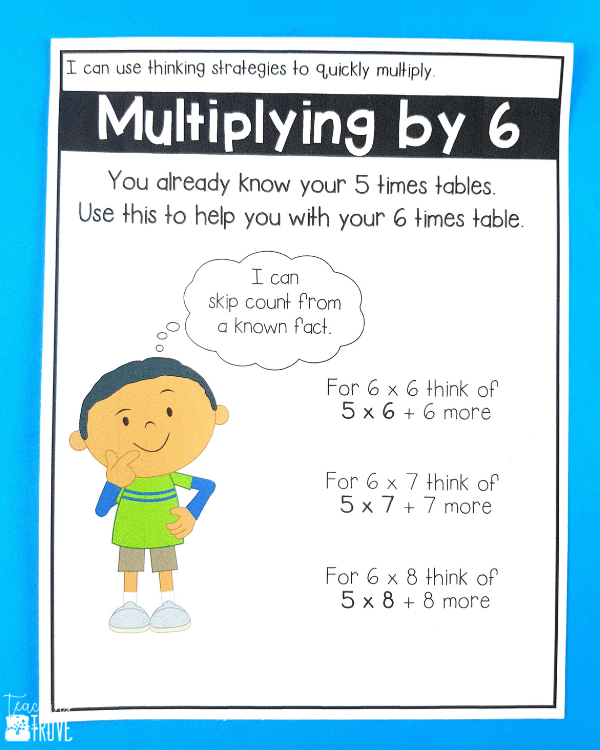 Each time you teach a new multiplication thinking strategy display it for your student to refer back to. Use interactive notebook pages or mini thinking strategy books for them to write the answers to their facts. And of course, it goes without saying, provide lots of fun practice time with lots of fun activities. 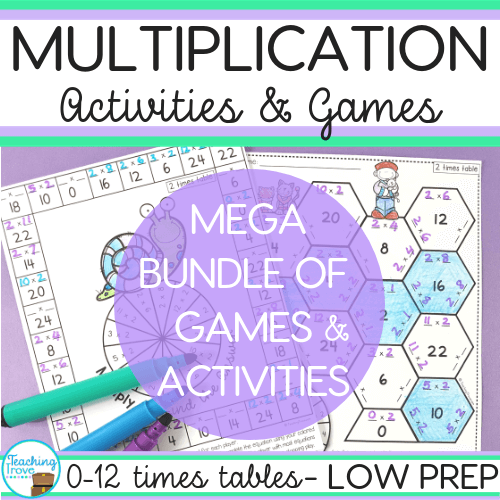 Love to try a set of games for the three times tables? Just click below. 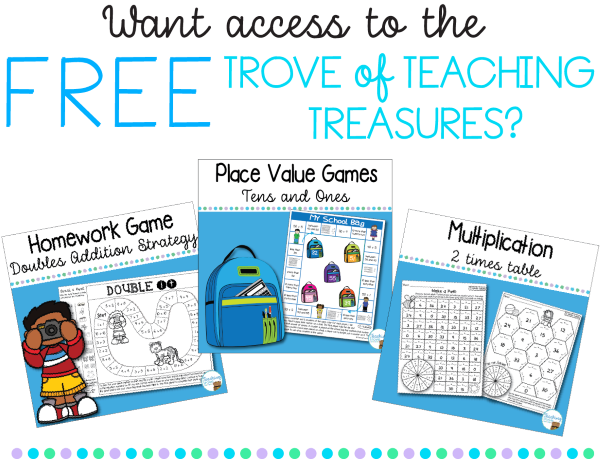 If you’d love to teach your students the mental math thinking strategies using the resource above, you can find it in my Teachers Pay Teachers store.